The New York City mayor says the "millionaires tax" would provide a steady source of funding. Sen. Bernie Sanders is throwing his support behind a new tax to fix New York City's transportation. Dubbed a "millionaires tax," the plan would hike state taxes for New Yorkers making more than $500,000 a year and use the money to rebuild the subway system and reduce fares for low-income families. New York City Mayor Bill de Blasio first outlined the plan in early August; he said Monday that Sanders' support helps move this issue. Both politicians argue the plan promotes economic justice for the middle and working classes. "We have to understand that a millionaires tax to fix the MTA is another way of responding to the inequality that plagues our society," de Blasio said during a joint press conference on Monday. New York Governor Andrew Cuomo declared a state of emergency for the subway system over the summer after a train derailed. He also pledged an additional $1 billion for the improvement plan. The Metropolitan Transportation Authority chairman said the mayor's plan doesn't provide money now for improvements. The MTA said it needs over $800 million to first bring transportation maintenance up to date. 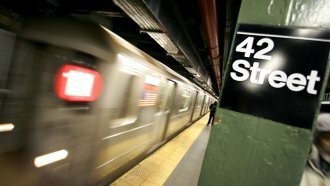 Since the subway is run by the state, the issue of funding is often a sore spot between the governor and the city's mayor. De Blasio argues the MTA can already access enough money to make the immediate improvements and claims the millionaires tax would provide it with a steady stream of revenue for the future — an estimated $500 million a year. Both de Blasio and the governor are Democrats, but the fate of the city's transportation system lies with the Republican-controlled Senate. Aging infrastructure and lack of funds is an ongoing national problem. Boston is also currently looking into a millionaires tax to fund transportation and education.